The quiet that a winter snow brings with it can almost suspend time. Watching these Black Angus cattle in the distance I could hear only the wind. They were motionless. Frost’s “Stopping by Woods on a Snowy Evening” came to mind. 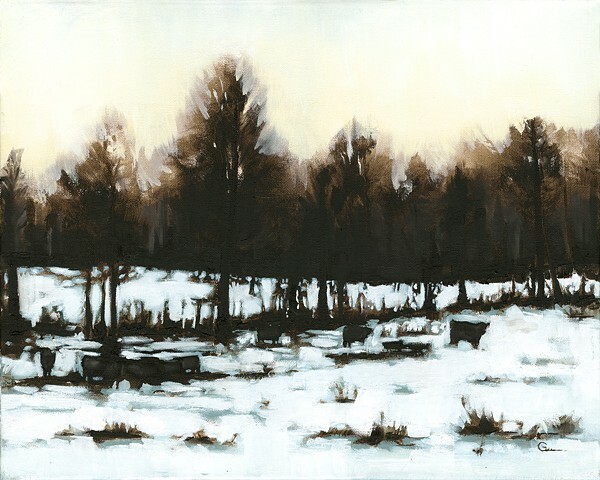 The moment captured in this painting contrasts the cold blue shadows with a warm sky at the top of the tree line. However as with most days, after a brief hesitation there were promises to keep.